Habitat Plateaus of mountainous regions, forests and valleys of southern Saudi Arabia and Yemen-Arboreal lizards, meaning they prefer to live high up in trees or lower near the ground in bushes and shrubs. Like most chameleons, veiled chameleons are specialized tree dwellers. They have a flattened body meant to mimic a leaf and feet specially designed for grasping limbs and branches. They have a prehensile tail that acts as a fifth appendage and aids in climbing. Their eyes work independently of one another allowing the chameleon to look in front of and behind itself at the same time. They have a long sticky tongue that they use to capture their insect prey. Veiled chameleons are ambush predators and are capable of lying still for very long periods of time waiting for an unsuspecting locust to wander by. 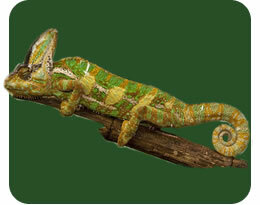 The male veiled chameleon is green in color and, depending on mood, this green will range from a bright lime green to a drab red olive, while non-breeding females and juvenile chameleons are generally a uniform green color with some white markings. The prominence of these markings is dependent on several factors including health, mood, and temperature of the lizard.